This is our longest tour at an amazing 90 minutes flight time. 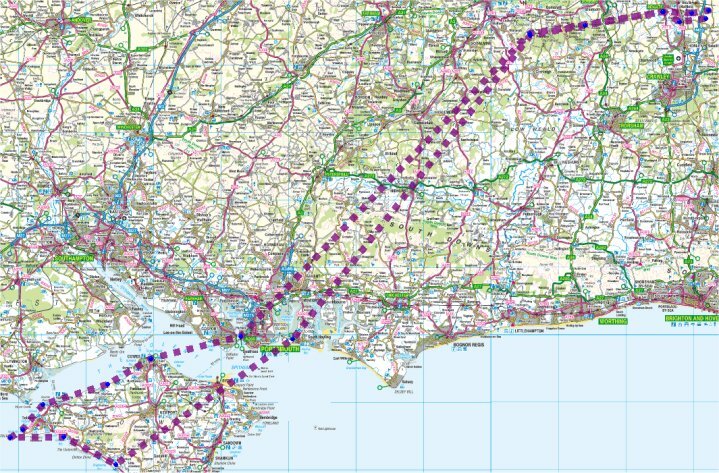 Starting from Redhill Aerodrome and flying west past Dorking, Box Hill and Denbies Vineyard. Flying over the lush woodlands and past the stunning Paladial Mansion of Albury Park you head south through beautiful valleys, passing many impressive country homes. Next is Dunsfold Airfield home of the BBC program Top Gear. Continuing south you over fly the market town of Midhurst with the ruins of Cowdray House set within the stunning “Capability” Brown landscaped Cowdray Park. Then crossing over the South Downs you will see The Isle of Wight in the distance. The flight takes you over Hayling Island, where the windsurfer was invented. Heading out over the Solent towards the four 18th Century Forts that guard the Solent (Now all private homes or Hotels) you arrive over Ryde on the Isle of Wight and follow the River Medina to the town of Newport in the centre of the Island then on towards Blackgang famous for smugglers of yesteryear. This particular section of cliff and coastline is famous for Dinosaur fossils and the clearly visible rapid erosion by the sea, many houses now perilously close to the edge! Following the shoreline you continue westwards towards the famous Needles. You swoop low over the water to get an unsurpassed view of these jagged rocks and the lighthouse. Turning back towards the east you will follow the northern shoreline to Cowes, the sailing centre and capital of the island. Many yachts adorn its harbour, you may even be able to see some of the exciting racing events that happen all through the year. Just to the east of Cowes is the imposing Osborne House. Queen Victoria and her husband Prince Albert bought Osborne House in October 1845. Prince Albert designed the house himself in conjunction with builder Thomas Cubitt the London architect and builder whose company also built the main facade of Buckingham Palace. Crossing the sea back to Portsmouth, home of the British Royal Navy. As well as a fantastic view of The Spinnaker Tower, you will also see the Portsmouth Historic Dockyard with HMS Victory and HMS Warrior. You may also see some of the visiting ships in the Naval Dockyard that come in from time to time for a refit or naval celabrations. Now back over the open countryside you head northeast over flying small villages and market towns such as Chiddingfold. In the distance is the North Downs and Surrey. A trip that you well remember for some time, showing the stunning countryside and the varied coastline of Southern England. Flight time: 90 minutes. 9 month voucher. Hire Whole Helicopter. £950 – up to 3 seats, £1100 – up to 4 seats.